The bilateral trade relations between India and Japan are built on a range of breathless possibilities endorsed by tenuous past and new emerging stereotypes. Both Japan and India agree that a sizable trade exists between the two nations, but their assessment of this trade and its potential differ radically. These differing perspectives are based on a number of factors ranging from economic and political to cultural and social. The Indian Prime Minister Dr. Manmohan Singh's visit to Japan in December 2006 must be seen in this light. Undoubtedly trade between the two countries is on the increase, if we take into cognizance the ODA Japan offers to India and the large contingent of Indian IT professionals working in Japan. In itself, this looks quite promising, but is not enough. Military, economic, educational and infrastructure cooperation between the two countries are either minimal or virtually non-existent. Japan believes that any such cooperation functions in the realm of possibility while India thinks it is a forgone conclusion. Differing perceptions are also visible in the way both countries interpret trade relations. Japan sees a significant growth in the actual volume of trade with India, while India sees stagnation. In the recent past we have seen the rise of Indian schools in Tokyo and Yokohama, but they are meant predominantly for children of Indian expatriates. Japan's perceptions of India are changing, not changed. The popular stereotype of India as a 'poor country, curry rice' is gradually being replaced with a new stereotype, '20x20 and IT.' This new stereotype is altering the image of India amongst the general populace in Japan, but most people, other than those directly involved with information technology, do not know what to do with it. Japan has yet to fully comprehend the potential of the Indian market, and for that to happen, it has to shed its condescending attitude of being the reigning economic superpower in Asia and the giver of economic largesse first to China and then to India. This unequal relationship between Japan and India comes in the way of fully comprehending the message that the Indian prime minister carried to Japan last year. Centuries of looking towards Europe, for both ideas and technology, and during the post-war era focusing primarily on the United States for practically everything from military protection to language learning, Japan has not been able to escape the rather circumscribing and often debilitating influence of the American and European political and economic hegemony. However, in the last few years Japan's growing ambition to become the leader of the world, claim a permanent seat in the United Nations Security Council, become autonomously capable of handling China's muscular foreign policy, deal effectively with North Korea's brinkmanship, and combat Russia's maritime assertiveness, has forced it to question Article 9 of the Japanese Constitution that prohibits the possession and use of nuclear weapons and start a contentious debate about the nuclear option. This new shift in Japanese thinking, which Prime Minister Shinzo Abe has termed 'nation-building', can make Japan more self-reliant and assertive in world affairs. The political notions of nation building and an independent foreign policy have brought about many structural changes in the bureaucracy and administration that will finally impact on bilateral trade relations between Japan and India. When Manmohan Singh was in Japan the Japanese Diet passed a bill upgrading its Defense Agency to Defense Ministry. This will enable the Defense Ministry to decide its own budget and not seek the direct approval of the prime minister. India feels that the recent endorsement of its status as a responsible nation by the United States after the passing of the civilian nuclear transfer of technology deal would automatically allow it to be accepted by all pro-American nations, more so when China its main adversary has given the deal a clean chit. Undoubtedly the recent American tilt towards India and India eschewing decades of pro-Soviet foreign policy have taken Japan and the rest of the world by surprise. Harried by China's objections to former Prime Minister Junichiro Koizumi's visit to the Yasukuni Shrine, and the eliding of wartime atrocities by the Japanese Imperial Army in China, Japan has increasing faced obstacles in developing a viable trade partnership with China. We must, however, remember that in spite of anti-Japanese sentiments fanned in China, China was the most important trade partner of Japan superseding the United States. This rather complex Sino-Japanese relationship coupled with border disputes with South Korea and Russia has created a strong threat perception in Japan where Japan seeks constant reassurance from the United States for protecting its sovereignty and integrity in the eventuality of a nuclear strike by any belligerent nation. The recent assurances by the U.S. Secretary of State, Condoleezza Rice, that the United States possesses the capability to protect Japan were highly publicized by the Japanese media more than Manmohan Singh visit. The Japanese threat perception has triggered calls from within the LDP to conduct a national debate on the nuclear issue strongly denied by the top leadership of the party. However the increasing concern with national security and differing voices on the nuclear issue itself constitutes a debate though of a lesser intensity than the one that emerged in the 1960s in India in the wake of its defeat in the Sino-Indian war of 1952 and the subsequent nuclearization of China in 1964. A perceived threat as many nuclear analysts believe is invariably the most convincing argument that can be put forward by any national government before its populace for endorsing a nuclear policy. This is what Japan is doing now. In itself, this may not be important for India but changing notions of the nuclear issue has altered Japanese perceptions of India's nuclear policy. Since the last few decades Japan has been a vociferous critic of India's nuclear policy and did not see much in common in terms of national values and priorities. The Indian economy too had nothing to offer Japan. From the early to the middle of the twentieth century the exploitative nature of the British colonial economy did not allow India to grow. Even after independence in 1947, Indian economy grew by a meager 1 percent. Only with the rise of technology and private entrepreneurs in 2000 Indian economy showed a substantial growth of 6 percent. Recent 8.5 percent growth rate has surprised even the erstwhile colonial masters. The Said Business School, University of Oxford is collaborating with The Confederation of Indian industry (CII) to set up a Business Center in India and the U.K. to study the reasons for the phenomenal growth of the Indian economy and its transition from poverty to prosperity. The changing geopolitical reality in the world has realigned nations in a new constellation against the emerging threat of what is termed as 'Islamic terrorism' and the Chinese dragon. These two threats, felt more by the United States and less by Europe, have reconfigured the global politics of the Cold War period in Asia and shifted the focus from the threat of the spread of Soviet communism to the spread of fundamentalist Islam. In other words, the United States, Japan and India have increasingly begun to feel the emerging threat of China to the peace and stability in Asia. Though the U.S. tilt towards India and India's shift from Soviet communism to American capitalism have been in the interest of both the countries, it has nevertheless reconfigured the power balance in Asia. Now China's hegemonic intentions can be challenged and contained by a strong and emerging nation like India. India's emergence as a young nation with 52 percent of its population below 25 years of age has drawn the attention of both political analysts and demographers who see India in the immediate future as outpacing China. Einoske Sakikabara of Waseda University argues that within ten years India will outpace China in commerce and other areas, something that even Indian planners would find hard to endorse. India is envious of Japan working with a low population though does not fully comprehend the problems arising from a graying population and declining birthrate. The high standard of law and order in Japan, developed infrastructure, and total commitment to work even at lower levels of the social system are the envy of both Indian private entrepreneurs and professionals, something missing in India. Encouraged by the Japanese investment in the Delhi Metro and purification of a stretch of Ganga River, Indian leaders are calling for a larger ODA investment by Japan in India which could bring rich dividends in the future. In fact at present the ODA has extended yen loans to nine projects in India ranging from the prevention of diseases to reforestation and fast transit system. The success story of the Japanese automobile company Maruti-Suzuki in India in the last few decades is always shown as an example of the enormous potential that Japanese investment has in India. Encouraged by the incredible sale of its cheaper car models Maruti 800 and Zen 1000, Suzuki has planned an additional investment of 210 billion yen in India by 2010 to increase production and sales. Japanese themselves are surprised that not so popular companies in Japan are making tremendous profits in India and have proved to be second to none in road worthiness, maintenance cost and fuel efficiency. Surprised by the success of Suzuki, Toyota Motor Corporation has set up a plant in south India which will produce compact low priced cars by 2010. Other Japanese companies such as Zentek Technologies, Mitsubishi-UFJ Securities and Nissan have already entered the Indian market to make a kill. If the highly skilled workforce of Japan can combine with the high technology professionals from India it would not only benefit both the countries but also revolutionize Asia at large, thereby providing the necessary counterbalance to the hegemonic ambitions of China in both commerce and politics. Another area of cooperation could be in the medical profession. As Japan faces a shortage of competent doctors and qualified nurses, it can exploit the rich resources of the Indian medical industry'which many U.S. companies are already doing'if both nations can overcome the linguistic divide. Junichiro Koizumi's visit to India in 2005 has greatly encouraged the learning of Japanese language and the craft of origami in Indian schools. The demand for Japanese language learning has increased in the western states of India and language-learning centers have increased in Poona. Japan can profit from a competent ESL workforce in India, another country like the United States, which was an erstwhile colony of the British Empire. It was expected that the recent visit of the Indian prime minister would leave an indelible mark on the Japanese consciousness but sadly it did not draw the attention of either the media or the public at large. The Indian media on the contrary placed great significance on the visit. Most Japanese were ignorant of the visit and the Japanese press paid scant attention to it. On the contrary both the Indian press and NDTV publicized the prime minister's visit to Japan including the joint communiqu' from the prime ministers of both the countries. This could be a matter of differing perceptions. The Japanese feel happy with the 'Look East' policy of India, while the Indians feel frustrated that Japan is not doing enough to promote bilateral trade. The Japanese argued that in 2004 the actual volume of trade between Japan and India rose by 16 percent and 80 more Japanese companies were added to the list of already existing 220 companies doing business with India. Japanese business houses were elated by the fact that 90 percent of Japanese companies were making substantial profits and were considering expanding their operations in India. The Indians on the other hand felt that trade with Japan at 493 billion yen represented stagnation when this figure was compared to the trade with China and Korea. Japanese investors do not find enough information about trade with India in Japanese, while the few books available in English written by Japanese experts are merely a rehash of newspaper articles. Indian investors feel the huge investment potential of about 1.2 trillion yen exists in India especially with the proposed quadrilateral railway line linking different parts of India and other infrastructural investments. It must be remembered that Japanese interest in India is of recent origin beginning with the advent of Japanese automobiles in the 1980s. India's impressive economic growth of the last two decades, spearheaded by the Indian Institutes of Technology, has generated a keen interest in the Indian technology-and-mathematics-based education system. Many Japanese universities are trying to comprehend the quality and caliber of IIT education and establish a link with some of its distinguished alumni. With the changed American perception of India from a 'nuclear threat' to a 'nuclear partner,' Japanese criticism of India's nuclear status has also softened. 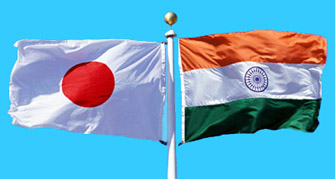 Japan too wishes to do business with India in the area of civilian nuclear technology transfer. Many Japanese companies are trying to cut a deal to build nuclear power plants in India to supply India's growing energy needs. These developments are heartening and a sign of a growing economic partnership between Japan and India. This partnership, however, will remain unequal as long as India depends heavily on Japanese ODA and Japan cannot expand business into other lucrative sectors like mobile phones, urban transit and infrastructure building. The CII has a point when it suggested that India and Japan should link their knowledge economies directly and share the transfer of technologies with each other more substantially than at present. Also the CII recommended that Japan should convert its ODA (Overseas Development Assistance) into FDI (Foreign Direct Investment) in order to substantially increase business with India.